Melanie Gary and Devon McCabe both have fond memories of the California tamale sellers who would drop in at the office or pedal around the neighborhood with a cooler strapped to a bicycle in their respective cities. Neither knew how much they would miss the homespun lunch option – the dense masa, the spiced fillings – until they each settled in Olympia and realized there wasn’t a tamale vendor in sight. In an attempt to fill the local tamale hole, and gather enough cash for the rent, the two started something a little wild. Working from the most authentic tamale recipe they could find, Gary and McCabe, who had never made them before, set out to become downtown Olympia’s tamale street vendors. 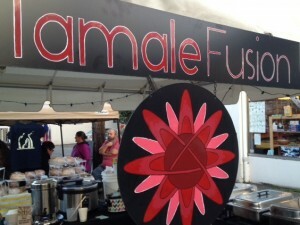 They started Tamale Fusion first as a delivery service. They also held a number of secret cafés and landed some catering gigs. Business was brisk enough to be encouraging but they realized it wouldn’t give them the kind of traffic they would need to grow the business into something more. Gary and McCabe believe in serendipity, a quality that makes them sensitive enough to leap when Possibility rattles the doorknob. Despite having no other income, they paid attention to the limitations of their business model and abruptly shuttered their street sales after only a few months. Then they enrolled in one ofEnterprise for Equity’s programs for microenterprise. The same sensitivity acted as a guide when it came to creating their product. Since tamales are a corn-heavy product, the two focused their first sourcing efforts on the controversial crop. “We were really excited to work with corn because we’re passionate about the political side of food,” Gary says. Conventional corn has been the focus of stinging criticism in recent years, both for its ubiquity and for the fact that a high percentage of the crop is genetically modified in the U.S. (about 88%). McCabe acted as researcher, looking not only for organic corn but for the most nutritious variety. The answer? Blue. They went through a similar process with the other ingredients. For fat, they use a biodiverse Moroccan extra virgin olive oil that’s rich in phytochemicals. 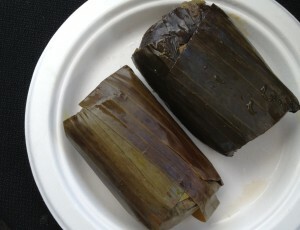 A Oaxacan-trained chef told them about the banana leaves used as tamale wrappers in the region. McCabe and Gary say they took his advice and switched to banana leaves because non-GMO, organic cornhusks are difficult to source and, anyway, they leach moisture from the masa. Banana leaves, in contrast, keep the tamales fresh. Gary says they haven’t gone a traditional route, as far as fillings, because her cooking background is one that draws together her love of different culinary cultures. The approach has led to original flavor combinations based on seasonal ingredients. A number of these have become staples, including Ethiopian Zigni W’et (spiced beef with ricotta and mint); Roasted Green Chile, Tomato and Poblano Peppers with Cheese; Jamaican Jerk Black Bean with Coconut Masa; and Sweet Potato with Roasted Green Chiles. They carry a variety of vegan options. 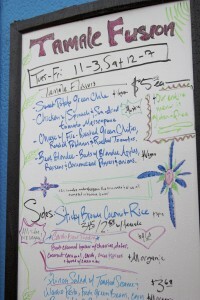 They also sell a hibiscus tea with ginger and lavender mint lemonade as well as handmade sauces. Gary and McCabe’s plan to launch as a wholesale only business took a turn when a friend and fellow food vendor pulled the plug on plans to open a food cart across from the Food Nook at the Fertile Ground Commons. With a cart and a location suddenly available, retail emerged as an option. The two changed their business plan overnight. 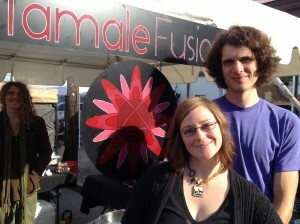 Two weeks later, they had the beginnings of a retail operation: their own cart and a Kickstarter campaign to retrofit it. 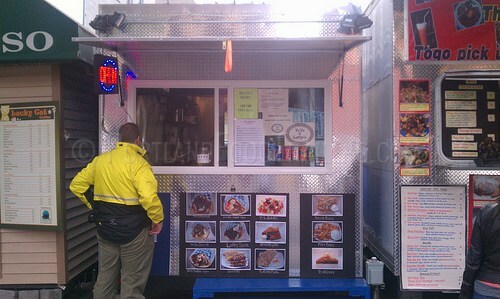 The changes to the cart were fully funded by the end of May and the cart opened for business on June 16. Now that the cart is established (open Tuesday through Saturday), Gary and McCabe have plans to sell wholesale once again. That means Olympia residents will be able to buy their stock flavors not only during cart hours, but at the Flaming Eggplant Café on the Evergreen Campus and at Method Coffee Bar downtown. Watch for their tamales in more South Sound locations in the months to come. So grab a tamale and watch the rest of the story unfold. Monday through Friday, 11:00 a.m. – 6:30 p.m.
Saturday, noon – 6:00 p.m.
Find out the latest flavor combinations on their Facebook page.